In my last post I described a nice little curved bottom block plane made by Justus Traut that dated from 1897-1902. We know that Traut spent a lot of time thinking about hollow and round bottom planes and put considerable effort into developing a metal alternative to the wooden hollow and round planes that were commonly being used in the 19th century. The typical carpenter or cabinetmaker’s tool chest would have housed numerous wooden planes, each designed to perform a specific task. These tools were elegantly effective, but they were also bulky and heavy, particularly when it came time to move from one job site to another. Cabinet makers and carpenters built those wonderful tool chests we all know and love to house all those tools and to protect them from weather and damage as the tool chest was moved from one job site to another over rough roads in a wagon. If you were an “inventive” craftsman it would take only a few back straining hefts of your tool chest before you may have started to think about ways to get around the problem of having too many planes to carry around. 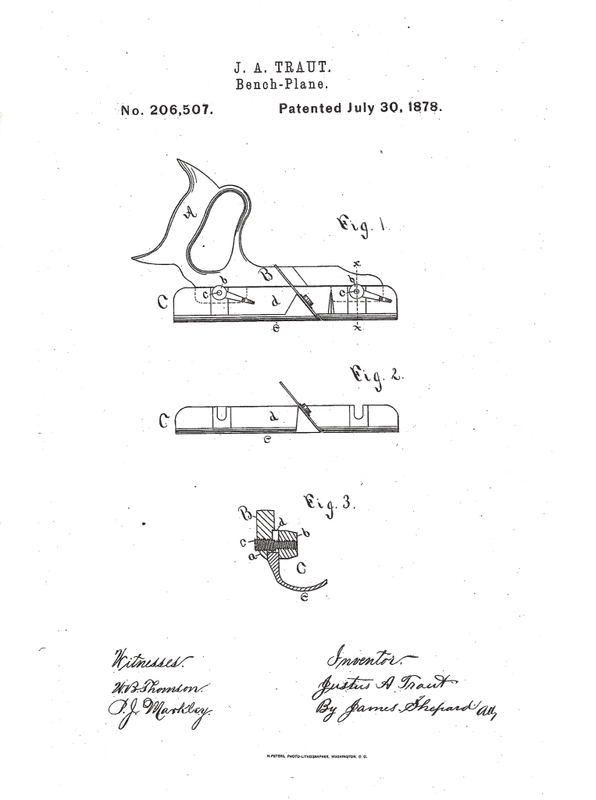 Not surprisingly, as cast iron planes became more acceptable, several inventors in the early 1870’s developed “combination planes” designed to allow a single plane with interchangeable cutters, bottoms, and fences to perform the functions of several different planes. 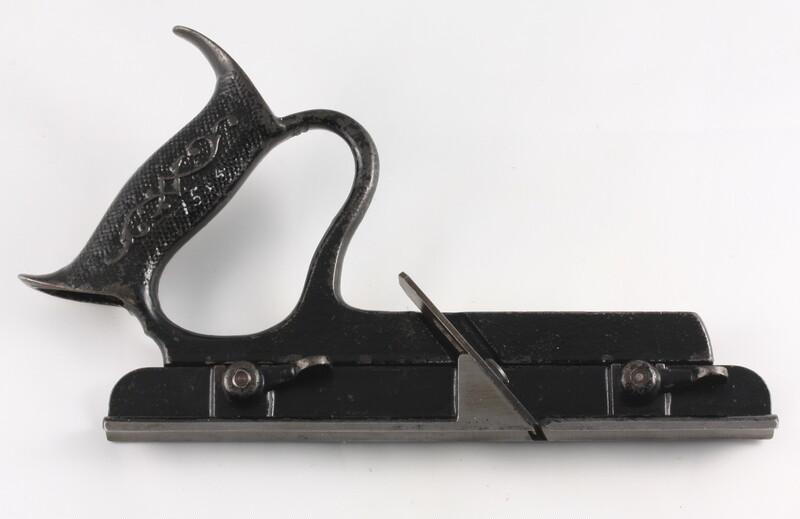 In 1871, Stanley Rule & Level Co. introduced the Miller’s Patent Adjustable Plow Plane with an eye towards dominating the combination plane market. 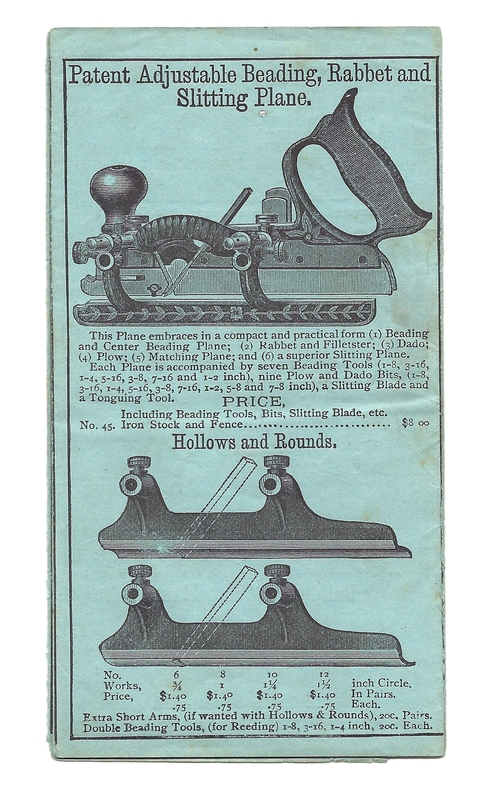 It was a crowded market with many aspirants claiming to have the best combination plane.¹ The Miller’s Patent Adjustable Plow Plane was not only beautifully cast with ornate Victorian designs but was also well engineered to produce excellent results. 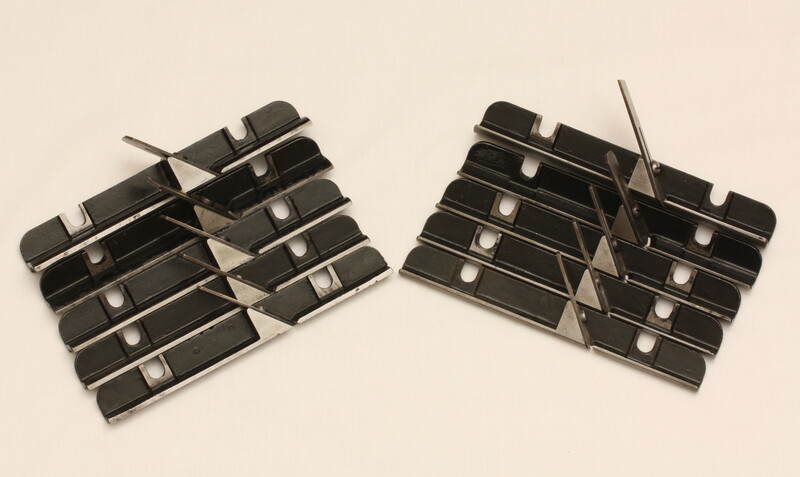 They were available in different configurations and finishes as the #41, #42, #43, #44, #143, and #144 planes. The #41-#44 planes were discontinued in 1897 and the #143 and #144 remained in production until 1943. Even today, these planes work very well and are a pleasure to use. 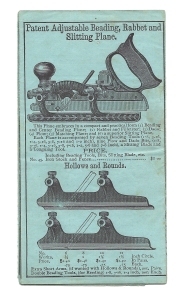 Stanley bought the rights to Rufus Dorn’s Patent Skew Cutter Combination Plane in 1872. It didn’t perform very well and by 1873, Justus A. Traut and his workmen at Stanley improved Dorn’s plane and it became the Stanley #46. The ideas and improvements continued to flow and between 1873-1897. 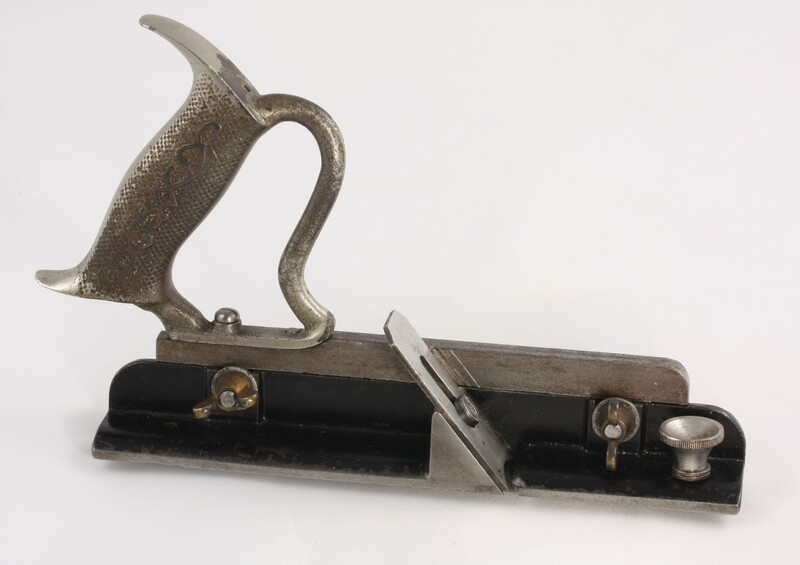 Stanley added the #45, #47, and #50 to their line of combination planes and indeed dominated the market. Traut and his workmen were instrumental in the development and success of these planes. He was granted 12 patents relating to “combination planes”. These planes did a fine job of rabbeting and plowing. They cut dadoes and could be used effectively for producing various molding profiles. But, they couldn’t cut hollows and rounds. Justus Traut was no doubt keenly aware of this deficiency and applied his mechanical talents toward solving this problem. The plane shown in the Figure 1 appears to be Traut’s first attempt at a combination hollow and round plane. It was found in New England in a house occupied by a man who had worked at Stanley for many years and came to auction in 1997. The plane was found in a nicely made walnut box with a sliding lid that in addition to the plane held five hollow and five japanned bottoms for the plane. The stock of the plane is a simple but nicely machined piece of cast iron that is 7 and 3/16 inches long and 5/16ths of an inch thick with a longitudinal rabbet on one side that holds the interchangeable bottoms firmly in place. The nickel-plated handle is identical to the handle found on the Victor #14. The front of the handle drops over a small upright pin in the casting and a round head screw placed through the rear of the handle is screwed into a tapped hole in the casting. This combination firmly attaches the handle to the body of the plane. The hollow and round attachments are very nicely cast, machined, and japanned. The japanning is almost 100% intact suggesting that these bases have seen very little if any use. The radii of the hollows are 3/8″, 5/8″, 3/4″, and 1″ (two of the hollows are in the 1 inch size). The radii of the rounds are 3/8″, 1/2″, 5/8″, 3/4″, and 1″. 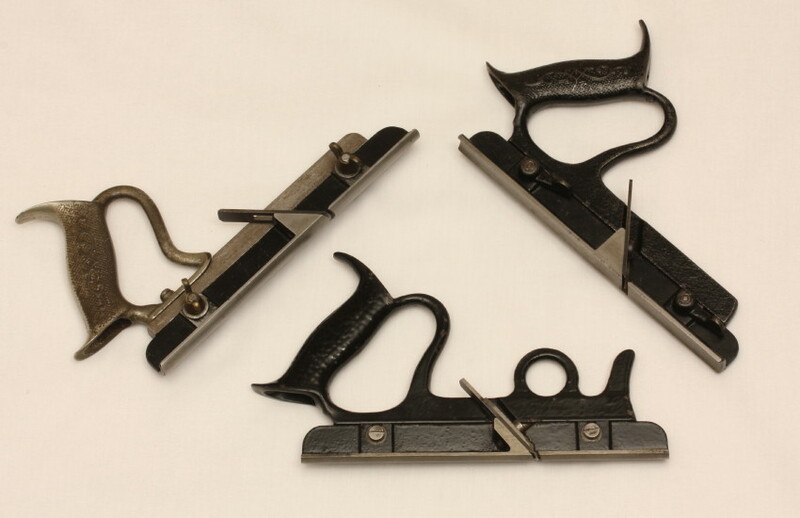 These interchangeable bottoms are held in place on the plane body by two brass screws identical to those seen on early versions of the Stanley #46 Skew Cutter Combination Plane. Three of the hollow bottoms have a nickel-plated knob on the front end. Two of the knobs are identical to those found on a #17 or #18 Stanley block plane. 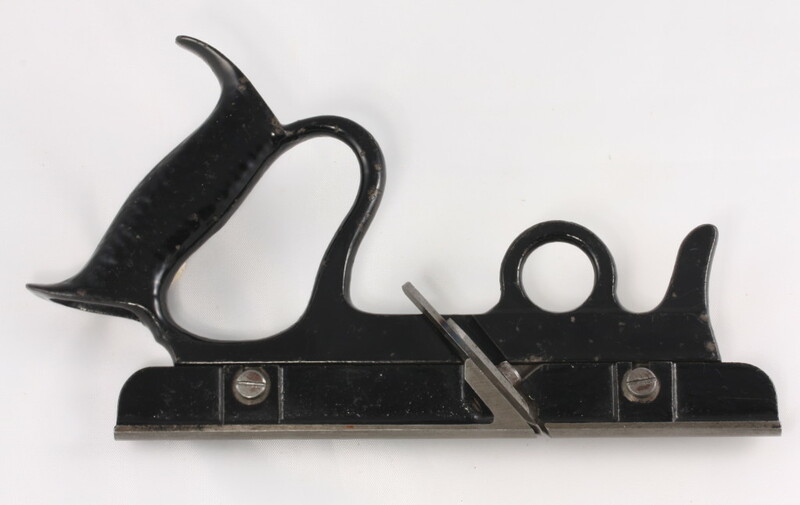 The third knob is identical to the small knob used to hold the rear rod in position on a Victor #14.² As is typical of many of the Model Shop planes, Traut was scavenging parts from other planes manufactured in the Stanley factory to put together his working model.The slotted cutters are attached to the frog of each base by a single screw. The interchangeable bases fit snugly against the body of the plane, but even with the widest hollow or round base attached the plane is not well-balanced. There is no comfortable location for the forward hand to rest on the plane. This problem is exacerbated when using the narrower bottoms and makes the plane awkward to use. Traut no doubt was acutely aware of the problems with this prototype and moved on to redesign the plane. The second version came up for auction in 2003 and was accompanied by a full set of 5 hollows and 5 rounds nicely japanned interchangeable bottoms. This version bears the Stanley Model Shop number 1564 on the tote of the plane and on two of the interchangeable bottoms. The 7 inch long japanned body of the plane on this version has the rear handle included as part of the casting and the interchangeable hollow and round bottoms are 8 and 9/16 inches in length. The bottoms are attached by tightening two small adjustable levers that are attached to the body of the plane. The slotted cutters are held in place against the frog of the interchangeable bottom by a single screw. 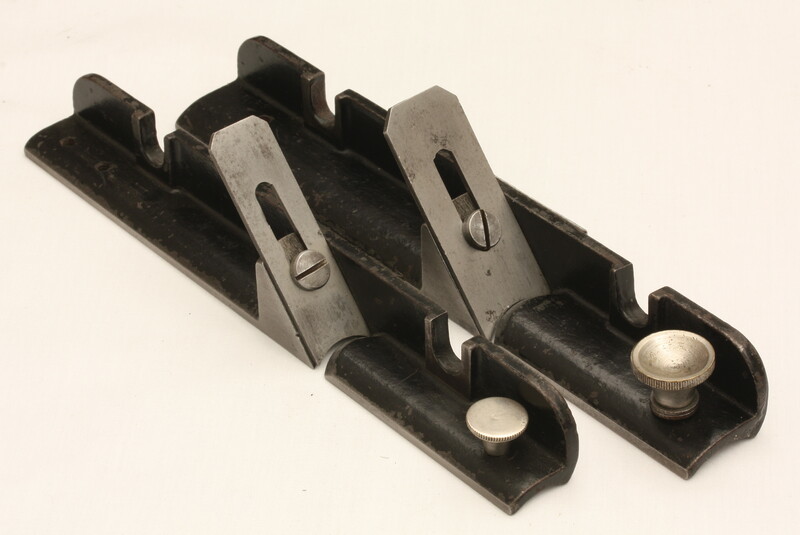 The interchangeable bottoms that accompanied this plane and those on the first version of the plane are identical and can be used with either plane stock. Traut liked this version of the plane enough that he submitted a patent application on June 3, 1878, and was granted Patent No. 206,507 on July 30, 1878 for the plane. In the patent he states that his plane, …”has for its object the production of this class of planes in iron, whereby they are more durable and as cheap or cheaper than wooden ones, and also to make one or two handles and frames answer for many stocks or for a complete set, whereby they are less expensive and occupy less space for storage than those heretofore made.” He claims as his invention the plane stock with the longitudinal rabbet, the two levers with both coarse and fine threads, and the slotted flange on the interchangeable bottoms. ( See Figure ). But this plane like its predecessor was not well-balanced, lacked a comfortable place to place the user’s forward hand, and was awkward to use. I am aware of at least one other identical example of this plane, but this one went back on the shelf in the Model Shop and never made it into production. Traut played with this idea one more time that we know of as evidenced by the third version of this plane which surfaced at auction in 2002. This version came with only a single 3/8th inch round bottom attached to the plane and does not carry a Model Shop number anywhere on the plane. The japanned body of the plane is 7 inches long and like the previous example has the rear handle included as part of the casting. The interchangeable bottom is 8 and 3/8ths inches long, very nicely machined and japanned but does not fit on the previous two versions of this plane. Traut abandoned the levers seen on the previous example in favor of having the interchangeable bottom held in place on the stock of the plane by two flat head machine screws. On this version Traut added a small lever cap over the slotted cutter and both are attached to the frog with a single screw. 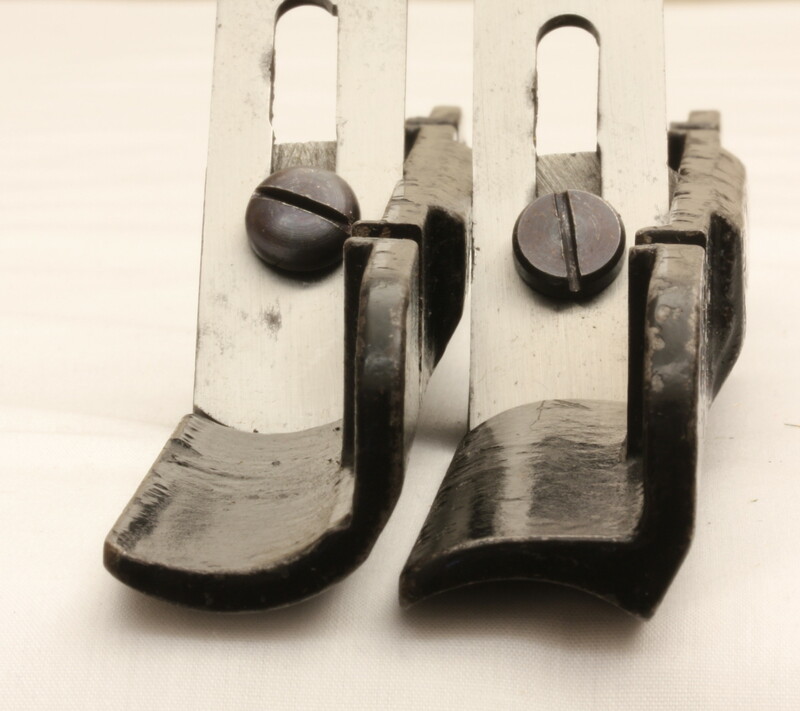 The significant difference is that a circular thumb hole and finger rest have been added to the front of this plane as part of the casting of the stock of the plane. The thumb hole and finger rest make the plane more comfortable to hold, but like it’s predecessors this plane never made it into production. ¹See, Smith, Roger K., Patented Transitional and Metallic Planes in America, Volumes I & II, to see the wide variety of combination planes being introduced to the market at this time. 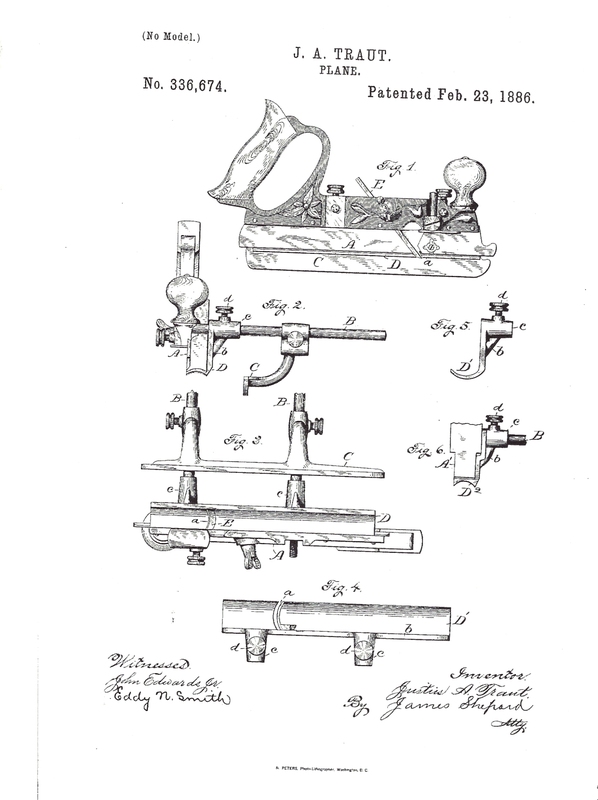 ² Charles Miller and Leonard Bailey were granted Patent #165,356 on July 6th, 1875 for the plane that Bailey sold as the Victor #14 Combination Plane. 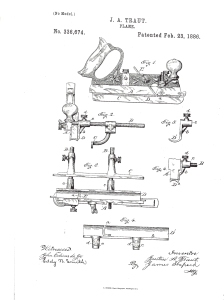 Miller assigned the patent to Leonard Bailey. On the same day, Miller was also granted Patent #165,355 for a tonguing and grooving plane. He assigned this patent to Stanley. Both of these planes had rear handles essentially identical to the one seen on this Model Shop Hollow and Round Plane. ³ It’s of interest to note that the sets of hollows and rounds seen with these planes includes a 3/8ths inch size. This size was never produced in the hollow and round sets produced by Stanley for the #45. Dave Heckel’s book, The Stanley “Forty-Five” Combination Plane, 2002 provides an excellent review of the #45 combination plane and all of its special cutters and attachments. Excellent resource, thank you for posting! Q: Is there a type study of H&R bases made for the Stanley #45? Thanks for your comment. If you can find a copy of David E. Heckel’s book, The Stanley “Forty-Five” Combination Plane, there is a type study of the hollow and rounds for the Stanley #45 on pages 105-108. I don’t know if the book is still available, but if you can’t find a copy, let me know and I can copy those pages for you. We use wordpress for our blogging platform. You can get a free account via wordpress.com and if your blog grows and you like it then you can move up to a paid account. It’s an excellent and popular blogging platform.